Uruguay cruised to a 4-0 defeat of Thailand in the China Cup final on Monday. Thailand had surprisingly knocked out Fabio Cannavaro's hosts in the semi-finals but found Uruguay a much stronger proposition at Guangxi Sports Center Stadium. 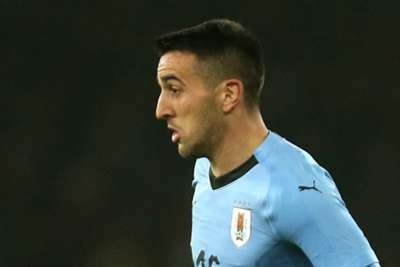 Matias Vecino and Gaston Pereiro scored before the interval to put Oscar Tabarez's side on track for a comfortable victory in Nanning. Striker Cristhian Stuani added a third after the break to finish as the mini-tournament's top goalscorer, with Maxi Gomez also on target late on to secure the China Cup crown. Uruguay took an early lead in their 3-0 semi-final success against Uzbekistan and did likewise in the final's sixth minute. Nicolas Lodeiro set up the opener for Pereiro in that game and he was again the creator of the opening goal, delivering a left-wing corner that Vecino met with a downward header. Chanathip Songkrasin fired wide at the end of a dangerous run but Uruguay scored a second before half-time, Stuani dribbling around defenders to find space in the left channel before delivering a low cross that Pereiro tapped in from close range. Siwarak Tedsungnoen saved from Stuani early in the second half but Uruguay extended their lead from the resulting corner, the Girona striker nodding in Giorgian De Arrascaeta's cross. Uruguay kept pushing for further goals and substitute goalkeeper Chatchai Budprom had to be alert to keep out a powerful low drive from midfielder Lucas Torreira. Peeradon Chamratsamee forced a save from Fernando Muslera as Thailand produced a late rally, but Gomez's deflected strike added a fourth for Uruguay. Tabarez's men, who were without injured forwards Luis Suarez and Edinson Cavani, will face sterner tests in this year's Copa America.